You didn’t think that we would make it back to America without breaking down did you? Winding down our Bahamian journey, we cranked over the engine in the pitch black, early morn before the sun was up. If there is a word to describe nervous, excited, anxious and sad all at once, that is what we felt. We were ready to be home. Ready to see our families. Ready for civilization. Ready for America. And yet, I cannot say we were ready to leave the Islands behind. An hour out of Bimini Sands Marina the wind is blowing directly out of the North. Those of you who are familiar with crossing the Gulf Stream, know that this is a huge “NO, NO.” Winds blowing out of the north, meeting the stream’s contradicting current, can create seas no one wants to experience. Both of us were tense, scared we were making the wrong decision to continue on. We were banking on the reported East wind to kick in, and push us back toward Fort Lauderdale. And yes! Later in the morning, the wind did swing around E, NE, and remained light. Too light, and there we were again… motor-sailing. Things were going smoothly. Very smoothly. If we have learned anything on this trip, it’s that when things are going your way, be prepared for them to not. Simrad auto-pilot on, music turned up, rolling side to side, slicing through the sea, sun shining, light wind, no one in sight. It was beautiful. Our last day to be alone and free. When all of the sudden, KNOCK KNOCK KNOCK. An insane and painful racket comes screaming from the basement. Katie and I nearly had a wrestling match to pull back the throttle and shut off her engine. We didn’t know what it was, but we knew it was bad. There we were again. 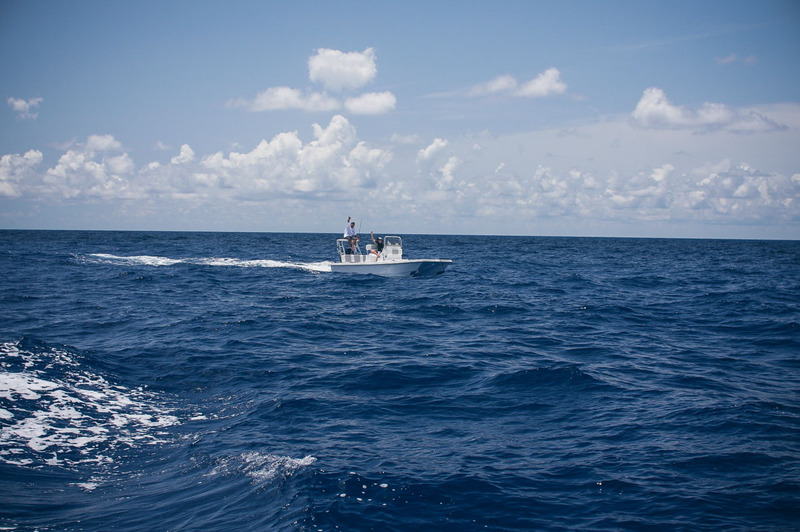 Two chicks, a dog, and a broken boat… this time in the middle of the Gulf Stream. With our sails up, the light breeze, and the relentless current of the Gulf Stream pushing us North, we could barely hold our course. We did our best to hold our ground as we went through our routine engine check. After process of elimination, and checking into several possibilities, we came to the conclusion that our problem was our prop shaft. It was clear that the entire damn thing was working it’s way out. Thank god, it was still connected, and we were not sinking into 9000 feet of water. The prop shaft goes through the bottom/haul of the boat before connecting to the transmission. If you lose the shaft, that means you have a decent sized hole in your boat. This is a common mishap, and any smart cruiser carries a spare prop shaft. Katie and Jessie, do not. We were smart enough to have a wooden plug of the correct diameter to plug the hole if we were to lose the shaft. All though we had located the problem, that did not mean we knew how to fix it. It’s really cool to have sails and all, but they are not always as beneficial as one would think. 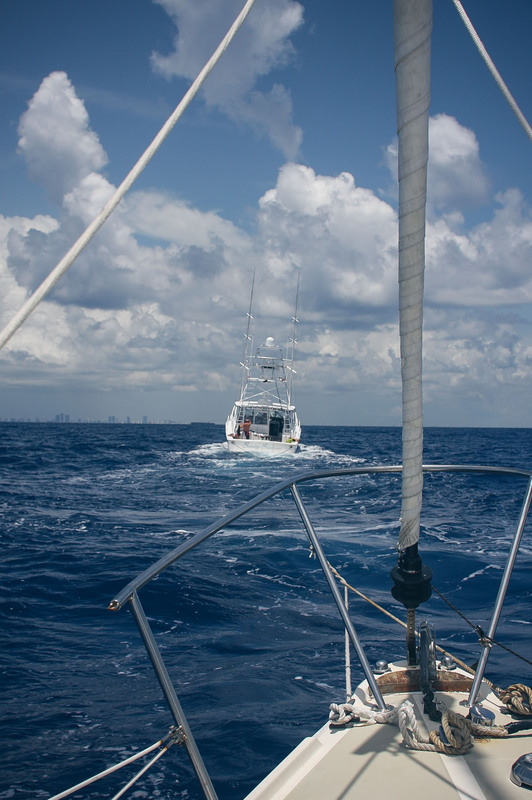 If we wanted to stay on a course to Fort Lauderdale, we were making about 1.5 knots. This would have put us in Fort Lauderdale the following day. No thank you. If we adjusted our course to make better time, we would have been carried to Georgia in the Gulf Stream. At that moment, we were in the thick of it. We didn’t want to go to Georgia. We had Reggie who had to get to land to potty before sundown, and then we had Black Dog, who was being flown to Fort Lauderdale that afternoon. Given that we were floating fairly quickly in the wrong direction, and knowing a tow was a necessity, we didn’t waste any time. Every 15 minutes or so, we would see a boat in the distance. Mostly large yachts and fishing vessels. We stood in front of the large white sails and waved our arms. We hailed every vessel we saw on the horizon over the VHF. Time and time again we were unseen or ignored. I made it obvious over the radio we needed assistance, but it was not an emergency. One sports fish was coming particularly close, and seemed to be on a course to Fort Lauderdale. We were certain this was our chance. Once again, we hailed over the VHF, and stood on the cabin top waving our arms. The boat flew right by us, and a family waved back at us smiling. NOOOOOO……. Turns out, the sports fishing boat who just roared past us, was a family we had met on a bus the night before on the way to the bar in Bimini. Dean on “Serenity Seeker” turned around immediately after I informed him we were engineless and covering no ground under sail. Seriously?!?! What are the chances, that we are 30 miles from land in each direction, and are being saved by someone we happened to meet the night before. We discussed plans to create a towing bridal to connect our boats. Dean warned us about the possibility of the cleats ripping out of our bow. Bow cleats are not the ideal way to be towed, especially in a 30 year old boat. Typically a boat has some kind of eye-let or hook rigged on the front of the haul below the bow, just above the water line for towing purposes. Louise does not. Serenity Seeker slowed to idle, which was still keeping us both moving at 7 knots. I never would have guessed being towed could be so stressful. The wind was still light, and the Stream calm as it rolled us side to side uncomfortably. We took turns steering, which was a full body work out to maintain a single direction while being pushed, pulled, and bullied by the rollers and tow rope. Quite frankly it was exhausting, and we had several more hours to go. The cleats warping and creaking from the pressure of being yanked around. To make matters more entertaining, this fantastic family, whose entire day was now delayed on our account, was not doing so hot. Because of their slow speed, they were being rocked around in an oscillating fashion, causing all 3 daughters to lose their breakfast over the side. With nothing to do but watch the show, Katie and I felt absolutely awful. At one point we even told Dean that we would figure something else out, and that they no longer needed to tow us. It was painful to watch the ladies get so seasick. Dean laughed, refused to cut ties, and happily towed us 25 miles before passing us off to Boat Tow US. This day once again demonstrates the kind-hearted boating community helping one another in times of need. Recently I’ve created a list of people who have gone out of their way to help us, gift or loan us something. This list is long. Dean and his family aboard Serenity Seeker were honestly a miracle. I have no idea how our day would have played out if it were not for them. Some advice for fellow boaters, please sign up for BoatTowUS. having a membership with them saved us over 1000 dollars, and they safely towed us to a marina off the intra-coastal, after Serenity Seeker handed us over. Arriving back in the states was not at all how we had imagined. We were tired and overwhelmed, but safe, and grateful. Once docked, we wanted off. Like children on a long road trip, caged and restless. We didn’t want to know what was wrong with Louise, and we didn’t want to know how much it was going to cost to fix her. So we abandoned ship, and headed for a house. YES, a house! A family friend put us up in his Fort Lauderdale home while we spent the week preparing Louise to be unattended for the remainder of hurricane season. Thank you Brain Keenan for giving us a temporary home, and thank you Dave Gillen Jr. for providing Louise a protected dock for the season. There is so much left to explain. What actually happened to our prop shaft. What we did to leave Louise for hurricane season. Why we left her. Where we are now, and what our next plan of action is. Stay tuned, many questions will be answered, half of which we are most likely still trying to figure out ourselves. Thanks to all who have kept up with us so far. I have been documenting this process for over a year now, and trust me it is still just the beginning. But every story needs an intermission. Family members of Serenity Seeker took their skiff, and spent the day fishing as we were being towed. These two guys had a great time, and didn’t seem to mind one bit that their 4 hour trip had turned into a full days event. Second leg of being towed… we got passed off to BoatUS who smoothly pulled us the last 10 miles, into the intra-coastal and several miles up a canal to a protected marina. Last head pump out session before entering America and having to re-plumb again. My favorite job. God Bless you two girls. Your parents have to be very proud of you. What wonderful stories you will have to tell your children and grandchildren. There should be more kids like you two and then we would not have to worry about the future of our country. Take Care. Awe, thanks guys. That is very sweet of you. Hope you are both wonderful, and safe. While in Lauderdale go to Jaxson’s Ice Cream! It’s kinda sad that I’ve lived there all my life and that’s the only immediate suggestion I can come up with, but it’s a good one. Yet another WOW … you two never cease to produce amazing life experiences. I’m relieved you’ve arrived safe and sound and Louise is in good shape. A 30 mile tow sounds like a bit of hell… but it’s a blessing that conditions were moderate. Did you consider tiying the tow bridle to the winches with a wrap around the bow cleats? I was thinking the winches are usually more strongly anchored to the hull. Attaching to a tow line around a keel stepped mast is another alternative. I am not clear… did you have hand steer while being towed? If so that sounds exhausting. Not exactly an exalted return, but any return in 1 piece is a victory and there are many lessons especially the kindness of sailors and people along the way. What a wonderful story. After the winter you, be itching for the sea again and miss Louise. Rest up more adventure awaits you. Hopefully, the crew of Sarahbeth is on that list somewhere :). I frequently check for updates, and am never disappointed. I hope your intermission brings you some relaxation and reflection. Every few weeks, we’ll joke, “What do you think Katie and Jessie are up to?” The responses won’t be the same now that you’re back in the states, instead of an exotic archipelago. Congratulations on completing that chapter of your circuit, and don’t leave us hanging too long for the next grand adventure. Many years ago I did what you have done so far. The rivers south to Mobile, around the ICW, crossing to the Bahamas, and, eventually, back. Your stories have brought back many great memories, including the need to change a prop shaft. I was solo sailing my Roberts Spray 28 that I built in company with two friends on their sailboat. They were getting the same noises you described. We had just crossed the stream and cleared customs in Lucaya. We found a quiet, empty cove to anchor in and decided the best, and cheapest, solution was to remove the prop shaft while at anchor. Yep, intentionally pull the plug on a big hole below the waterline LOL! I had two tapered wood plugs I took from my boat. When he pulled the shaft far enough out (it took several dives as no scuba gear) I drove in one plug on the inboard end to stem the flow until he drove in the second plug on the outboard end. Really turned out to be easy. We got the name of a machine shop, which of course was at the other end of Freeport. Taxes being expensive we took the bus. No one seemed to pay us any attention, two guys on a bus with a 5 foot prop shaft! The machine shop turned up a new shaft in a couple of hours and the operation was reversed. Success! I hope you finish the loop. I still have not. I quit in St Augustine because I was tired after a year of solo sailing and could not find anyone who wanted to go. So many people do not want to leave jobs. Too dangerous they believe. Back then the internet did not exist like it is today or I would have been able to find someone to share the adventure. I have always regretted not finishing the loop, so my advice to you is to finish it. You have company and that makes all the challenges easier to handle. So, I hope to read a lot more about your adventures. What a great adventure…you should both be very proud and we are very proud to know you and to have met you along the rivers and in Mobile, Alabama. We look forward to seeing you when you get to Georgian Bay and the North Channel next summer! a suggestion re the prop shaft: install a shaft zinc on the shaft inside the hull, just forward of the packing gland. If the shaft comes away from the transmission, it cannot leave the boat. You can use a new zinc or a partially deteriorated one which you have replaced form the outside.